Trying to find a resident to fill a vacancy? If you’re a property manager or a landlord, you’ll want to refine your understanding about a “good lead” — a prospect likely to convert into a high-quality, long-term resident — versus a prospect that will simply waste your time (or worse). But spotting the difference between the two can be tough, in part because there are many potential red flags that you’ll need to recognize in advance. Some leads might be no-shows for their scheduled appointments. Some prospects might not be ready to sign on the dotted line. Google search data has even revealed that some of your “prospects” might not even be located in your state! “There are three characteristics that indicate a highly qualified prospect: COMMITTED, INFORMED and CONNECTED. When a prospect calls, makes an appointment [and] arrives for their tour, they have become more committed. The more commitments, the more likely they are to reserve an apartment home,” said Mary Herrold, VP of marketing and business development at JVM Realty, a company that represents more than 6,000 units. First and foremost, understand what’s considered an “average” conversion within your industry. 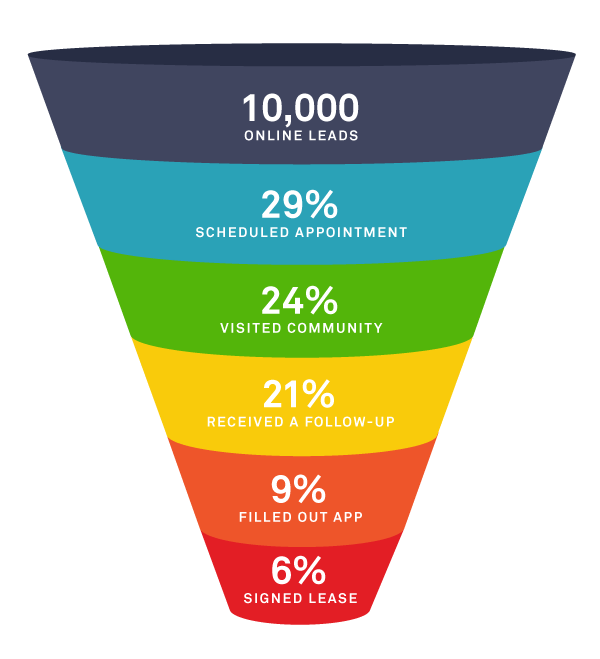 According to a Trulia survey of 10,000 online leads, fewer than 1 in 3 leads (29 percent) will schedule an appointment, and about 1 in 4 leads (24 percent) will actually show up to the appointment. Just under 1 in 10 leads (9 percent) will fill out a housing application, and around 1 in 16 people (6 percent) will finally sign a lease. The moral of the story? Be prepared for the leasing process, in part, to become a “numbers game.” Be ready to host a lot of showings, talk to dozens of prospects, and stay patient. Fortunately, as Trulia and Inman News discuss in the “2014 Rental Outlook: Why Your Business Should Be Booming” webinar, economic, demographic and technological shifts will make it easier for landlords to get a flood of rental leads for years to come, making this “numbers game” easier for them to win. Leads who schedule an appointment are three times more likely to convert into paying tenants than leads who make just basic inquiries. In other words: Scheduling an appointment drastically increases your odds of converting the lead. The drawback, of course, is that appointments are time-consuming. Some property managers and owners attempt to save time by prequalifying the lead before agreeing to meet for a showing. They’ll ask the lead to fill out a questionnaire or a preliminary application, and they’ll schedule a showing only if the lead passes this first qualification round. The problem? 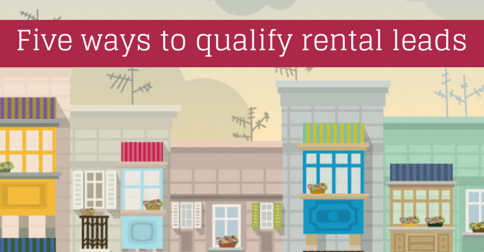 Many landlords miss the opportunity to connect with residents because of these hoops. Rigorous prequalification narrows the funnel, but not necessarily in an optimal manner. As an alternative, tell your lead about your housing criteria over the phone. For example, you might say, “We require a 700 credit score, no bankruptcies, and a take-home income that’s three times the rent. Will you be able to meet this criteria?” If the prospect says yes, schedule the appointment as quickly as possible. Verify the claims after they’ve filled out an application. In addition, “batch” your showings together, i.e., schedule multiple appointments back to back. This reduces your commute time. Your task? Advertise on multiple websites and track which leads come from these various sites. Your online listing should include basic stats, such as the square footage, bed/bath count, school district, price and lease term. Include many photos, including a few that feature the building exterior, and if possible, showcase a floor plan. Putting together this information actually reduces time spent qualifying and converting leads. Ask your existing residents to refer your units to their friends, family and associates. Consider offering a bonus, such as a $100 or $200 rent credit, for a successful lead. In addition, encourage your residents to engage with your management company (or building) on social media platforms such as Facebook, Pinterest, Twitter and Instagram. “Our statistics show that a person who is socially influenced via friends or family is twice as likely to reserve an apartment than someone who isn’t,” Herrold says. Here’s a sliver of bad news: Between 40 and 50 percent of leads don’t receive a response from the manager or owner they contact, according to a study by Multifamily Insiders, an online networking group for multifamily professionals. In other words, some of your competitors aren’t doing their jobs. That’s bad news for the prospects, but great news for you. Follow up with all leads, but push them through the sales funnel quickly. Prequalify the leads over the phone, and if they verbally promise that they can qualify, schedule a showing immediately. Ask your leads to fill out an application on the spot during the showing (bring extra pens!). “At JVM, our ‘dream prospect’ has a move-in date within one to two weeks; has visited our website, called and set an appointment; arrived at their appointment ready to reserve an apartment; applies; [and] has the ability to pay their rent and the propensity to be a nice neighbor,” says Herrold.